Chloe was born in Nice, France in 2005. She started learning skiing at age of 3 in France. Now she studies at Jean Franco Secondary School in Saint Etienne de Tinée, where during winter season, she skis 3 half days per week with school. 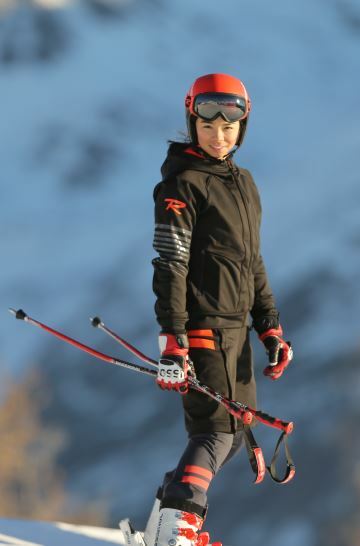 She is a ski competitor since 8 years old. She is a member of Interclub Nice. Interclub is a Ski club and trains Ms Nastasia Noens, Mr Matthieu Bailet, and Ms Margot Bailet who are representing France in International ski competitions. With a Hong Kong citizen mother, Chloe comes to Hong Kong every year since her birth. She feels like more or less as a Hong Kong citizen as her mother. She is 13 years old now, she would like to represent Hong Kong for international competitions and promote the sport of skiing for Hong Kong. As her wish, she would like to join Hong Kong Ski Team and represent Hong Kong during 2022 Winter Olympics.